It’s been a while and I’ve made a new friend. Let me introduce you to the SUPER PRIMITIVE! This idea was (maybe) originally conceived by Brenden and utilizes a short length of tubular, 2 carabiners and a pair of bandanas for tree protection. Carabiners have quite a bad reputation these days, so I decided to opt for aluminium rings instead. And although I really fancy bandanas, more conventional tree protection is advised. This kit is only to be used with stretchy webbings and lower tensions. You MUST use proper tree protection in order to not hurt the tree!! Something to sit on, so your arse doesn’t get wet. Let’s assume you desperately need at least one of the aforementioned things. How well does this system work? If you’ve seen Brenden’s video, you’ll likely be a little sceptic on the whole SUPER PRIMITIVE idea, since Brenden doesn’t weigh anything and the line he setup is quite short and quite loose. So basically, you might be inclined to think, it’s just a really obscure slackline solution that doesn’t really work well for most people. If that sounds eerily familiar to you, then you may have read some of our other articles. And you will not be in the least way surprised to find out, that NO!, it’s not a stupid idea for those who just like to rig in the most fabulous way possible. In fact, it is quite a practical and sensible solution for EVERYONE! 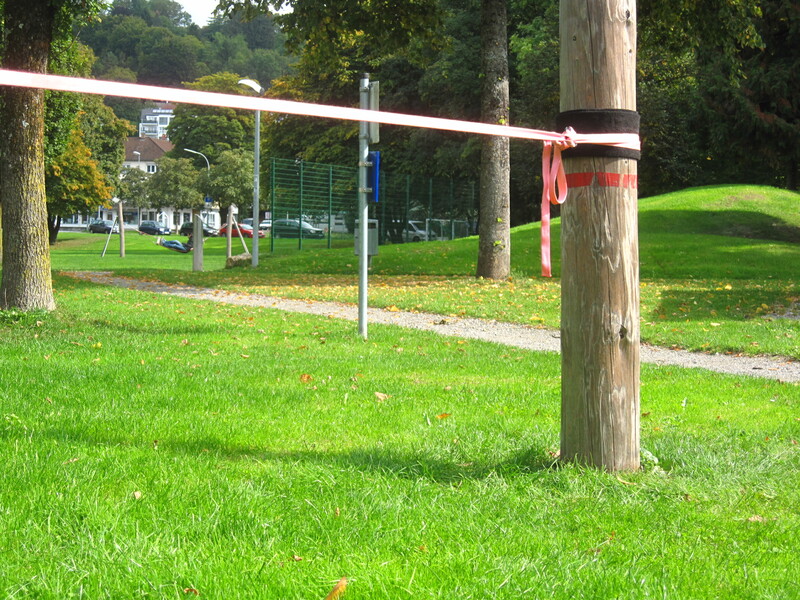 You want to get into slacklining, but don’t know what to buy? You have a tiny little bit of experience in rigging (you can tie a girth hitch), a tiny little purse (you find everything slackline related super expensive) and a tiny little backpack (you really do intend to read all those books for uni)? Look no further! This kit is ideal to get you started. Very little gear involved results in a low price and low technical complexity. It is easy to learn the rig, hard to get it wrong, easy to carry around and relatively quick to setup. The equipment has very few failure modes (as far as I can tell..) and all of them are fairly obvious and result in non-life-threatening failures (non-explosive loss of tension!). 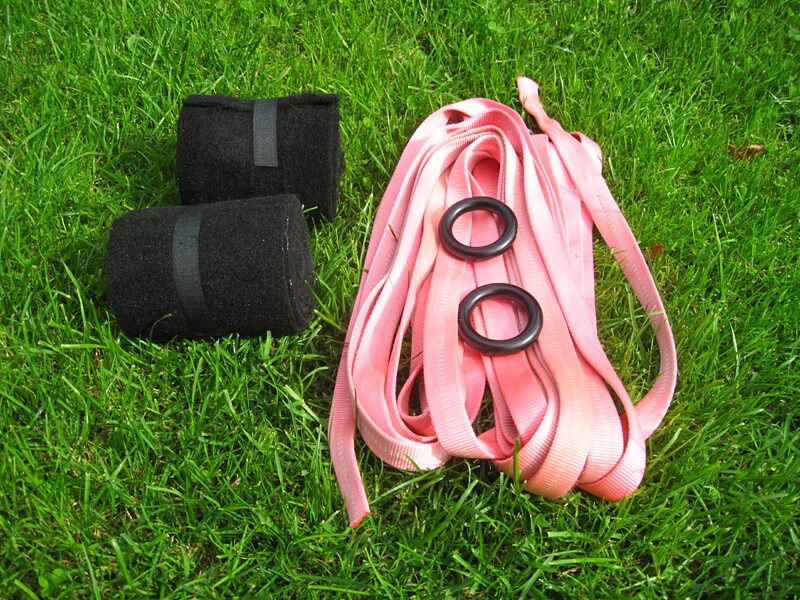 This kit is also great for more advanced slackliners to use as a secondary line to introduce more awesome people to this sport!! Spread the sag! The kit itself works just as well as a normal primitive. It is, however, much lighter. With the poles I have in my park, I feel like it is even more efficient than one on carabiners, although I cannot say for sure. Obviously, the rounder the tree, the more efficient the system is going to be. One could install a multiplier, but I never found that necessary. You can pull short lines shocklingly tight by yourself with minimal effort. I’d estimate that one can (without multiplier and no excessive effort) achieve ~1.5kN of base tension (the residual tension in the line after the tensioning process with noone on the line). This is enough for me to walk and play 22m with 2m anchor height and 12m with 1m anchor height on tubular (with lower stretch lines you can approximately double that length with similar sag, which would result in higher forces on your system though!). Or set up a short beginner line at knee height. None of the knots are difficult to untie and you can attach to a great variety of trees, since you aren’t limited by the length of your slings. Since the line is always vertical, you also significantly increase the visibility! There’s just never anything to say about rodeos. You should try a tubular rodeo. It’s FUN! That one is a little more specialised and might be covered in it’s own article at a later time. If you can’t figure out, how one would use this kit for adjustable slings, then you shouldn’t use this kit for adjustable slings. The less you carry, the less you carry. By which I mean that if you carry less equipment, you have less options available in case anything goes wrong. Right here, this might not be an issue at all, since there’s not much that can go wrong with a primitive in park, but for all those minimalist highline riggers out there (good work!) and be aware that you might be forced to improvise a rescue or a derig and it’s only okay to shed weight, if you don’t at the same time loose your ability to handle some unforeseen rigging challenges. On a related note, the SUPER PRIMITIVE is not all super. It’s lighter, cheaper, arguably less complex and generally more awesome than your everyday carabiner primitive, but it has it’s downsides as well! You have to thread everything. Obviously, this is only the case if you use a closed connector like the aluminium rings. This increases efficiency (cirular profile) and safety (no tri-loading problems, no inadvertent opening) to some degree, but can also be a pain, if your webbing is much longer than the line you rig. The webbing walks down the tree during tensioning. When you tension, the webbing moves over the tree protection (obviously) and it will follow the direction of pull. If you rig higher than you pull, the webbing will slide down and vice versa. This means you cannot (CANNOT) rig above head height. Not an issue for most beginners, but a definite bummer for me. Otherwise, it’s just as good as a primitive. 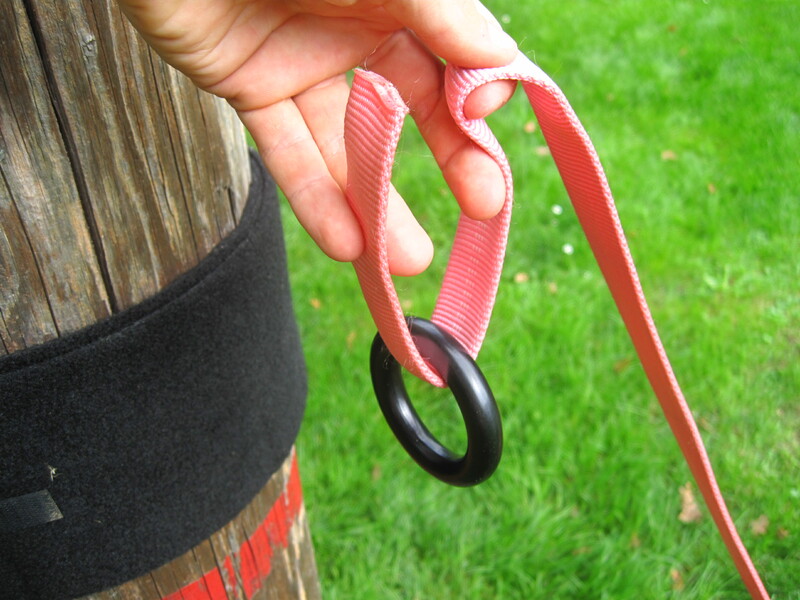 I advise everyone with a length of tube to try it, carabiner or rings make no real difference. And to anyone without a length of tube: Buy one! 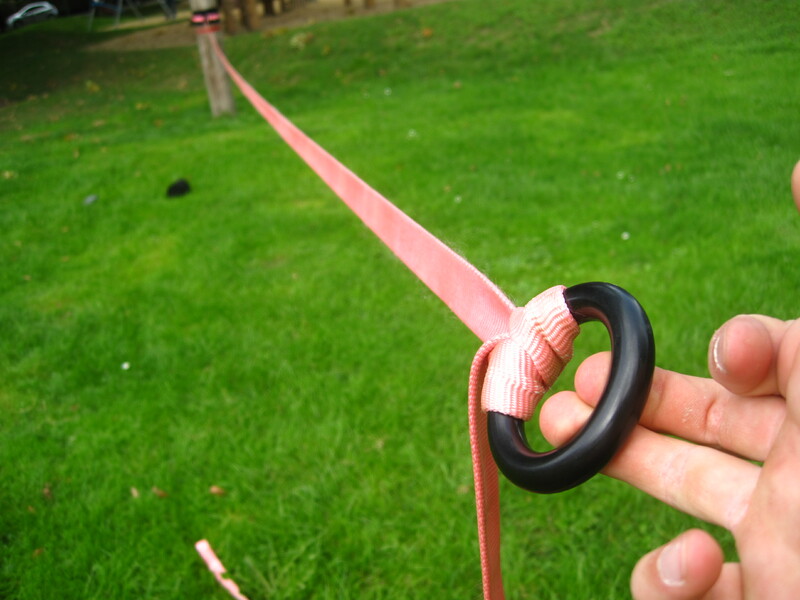 There is no lighter way to rig a slackline for interested soon-to-be-slackliners and it is a lot of fun to just play on a semi-loose tube every now and then. Awesome, you got everything! Let’s continue with the setup. First, determine which tree/pole should be your static side anchor (the less accessible one, the one in the shade, the one you’re closer to right now, ..). 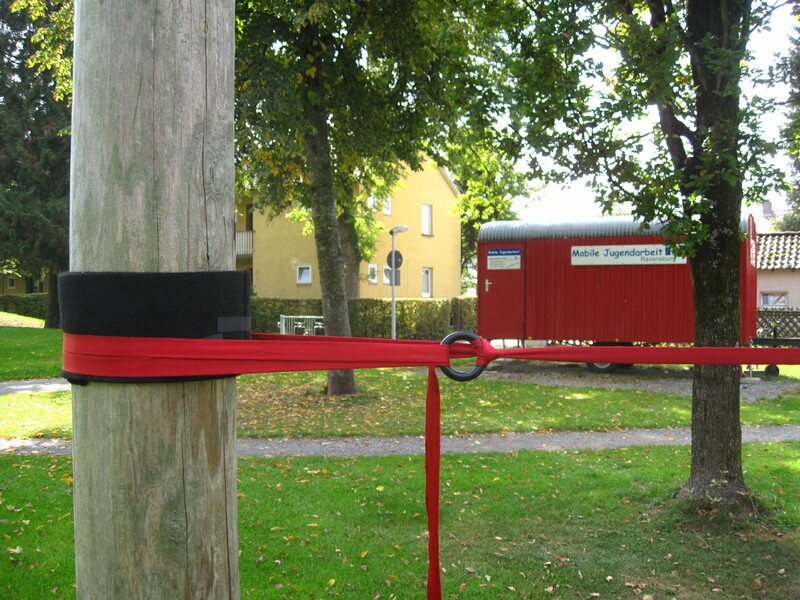 Go over and install the tree protection at the desired height (if you’re just starting to slackline, this should be around knee height). Then take the end of the webbing and thread it through one of the rings. 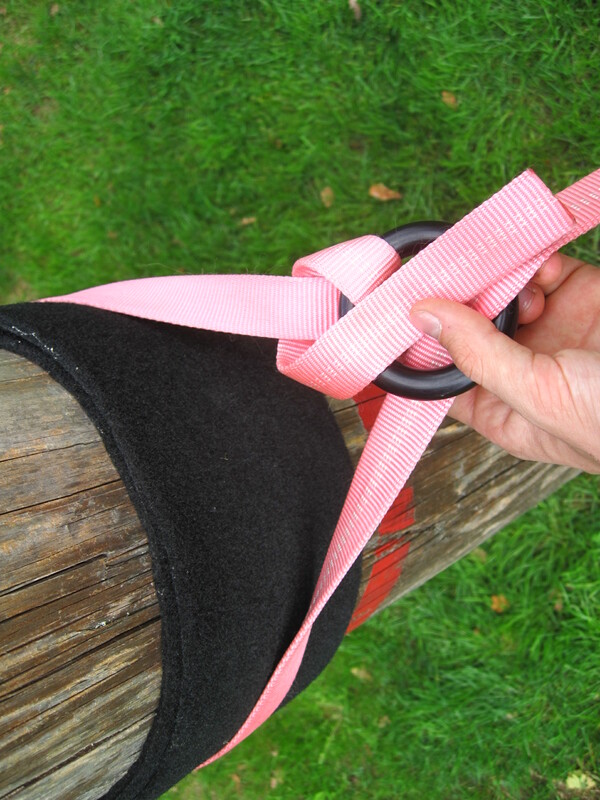 Go around the tree and tie a girth hitch on the ring with the end of the webbing, thereby tying a girth hitch around the tree with the ring and the webbing. Cinch it up and you’re done with the static side anchor. Now you have to choose the tree/pole for your tensioning side anchor. Start with 4-6m distance, if you never tried before and slowly increase the length after you can comfortably walk shorter lines. Try to rig somewhat leveled. As you go over, make sure the webbing lays flat and is not twisted. At about 4/5 to 5/6 of the way (you’ll know, once you get used to your webbing and your desired tension) you have to tie another girth hitch on the second ring. Make sure that the line entering (coming from the static side anchor) the knot is on top of the line exiting the knot. Install the second tree protection and pass the webbing around the tree in the direction it exits the knot (otherwise your ring will flip and introduce a twist in your line). Pass the webbing around the pole in the direction it exits the knot. Pass it through the ring. Go around the pole again! One last time through the ring! Tuck the second layer underneath the first to create a friction lock. The friction lock keeps the tension, almost done! Just another tie-off in case the friction hitch wants to slip. Time to slack the lightest rig ever! 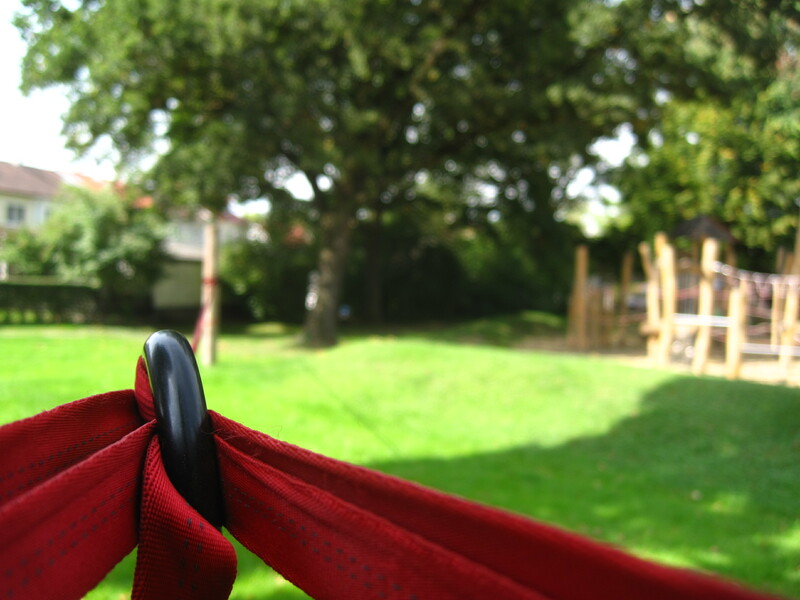 When you’re done, undo the tie-off and pull away from the pole to release the friction hitch and take down the slackline! Make sure you leave the spot cleaner than you found it!